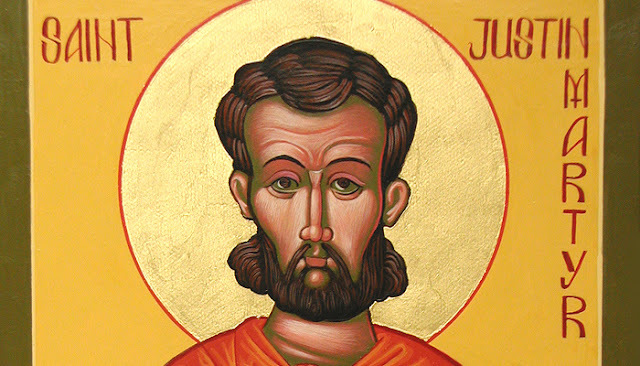 St. Justin was a philosopher and martyr, and was probably the most important of the second-century apologist Fathers. He set out to defend the new religion from the weighty accusations of both the pagans and Jews, and to spread the Christian doctrine in terms suited to the culture of the time. So, he had a twofold concern: defending the newborn Christian faith and explaining the content of the faith in a manner comprehensible to their contemporaries. Justin was born around the year 100, near an ancient city in the Holy Land, and was the son of pagan nobles, so he was not raised in the faith. But he was very well educated, studying poetry, history and science, and he was deeply schooled in the ancient Greek philosophers. Though he was not raised to know the truth about God, he was certainly on a quest for truth.